Clinging to the side of Bulbul Mountain outside of Ephesus, this site is believed to be the last home of the Virgin Mary, who is said to have come here towards the end of her life in the company of St. John sometime around AD 40. 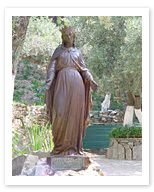 Officially recognized by the Vatican in 1896, after being described in visions by a German nun who had never seen the place- it hadn’t even been discovered yet - every year both Christians and Muslims, who honor “Meryemana” as the mother of a great Prophet, make religious pilgrimages to the site. There is a sacred spring here whose waters you may drink, and which are said to have healing powers. This site is one more example of Turkey’s absolutely amazing religious history. Throughout this country you will have the opportunity to walk in the footsteps of incredible people of all eras of history, both divine, and otherwise.